Model T Ford Forum: Head Bolt Length? 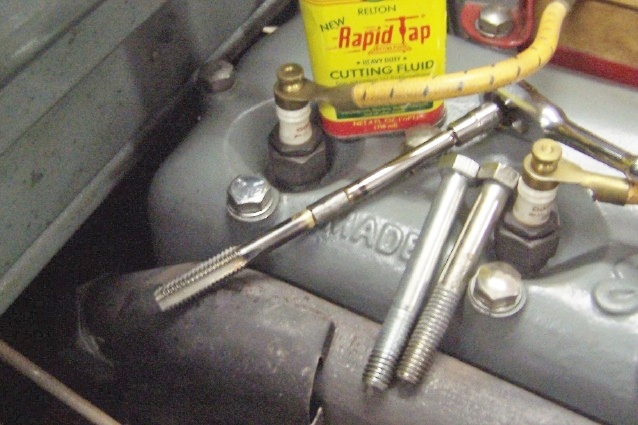 Model T Ford Forum: Forum 2013: Head Bolt Length? I had some 7/16 X 3 1/2 capscrews that I had used to hold the Z head down to my new 1923 block. I was a bit concerned about the screws bottoming so I used a pair of thin AN washers under each bolt head. This setup went right down to 50 lbs. torque without issues. Well, there was one issue, I hated the look. They were modern capscrews with modern low head, modern markings and the modern plating. Every time I touched them with a torque wrench my nice black paint looked more and more ragged. I see the vendors offering the '26/'27 style head bolts with the high doomed head and nickel plating. OK, not kosher for my year but they look a lot better and at least have a vintage appearance and look like they belong there. I ordered a set. Today I was looking forward to installing them but found when I compared them to one of the plain jane jobs I am looking to replace that the are shorter, only 3 1/4. They sure do look better but they grab three or four less threads. Can I use them? Will they still take the torque safely? Should I go all the way to 50 lbs. with a bit of anti seize compound? I worry about this because a year and a half ago after repairing a leaky head gasket I pulled a couple of threads and ended up having to resort to Heli-coils. I do not want to have to do that again! No way we can tell from here if the bolts are long enough. You need to see how much thread engagement there is. Be sure the holes are clean and the threads in good shape before attempting to torque the bolts. 50 Lbs ft dry should be safe provided that you are engaging 5/8" or more threads on each bolt. If you use anti seize or any other thread lubricant decrease the torque to 45 Lb ft. This will achieve the same amount of clamping force. Don't try this high torque number on pre - 1917 blocks, the iron castings are not as strong. The later blocks have better metallurgy. 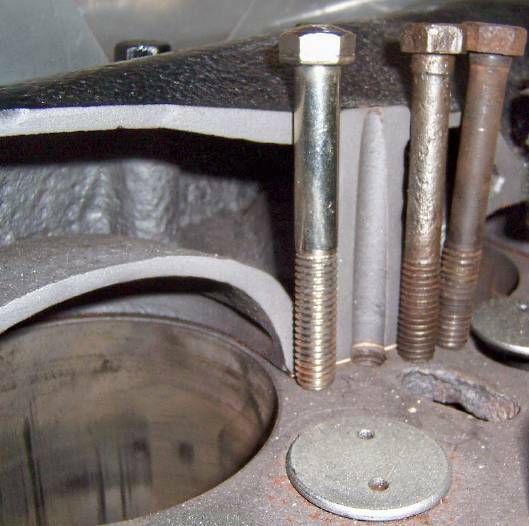 Note that Ford never torqued any bolt on a Model T, and there is no Ford recommended torque for head bolts. Ford had a worker tighten the bolts with a certain length wrench, designed to give adequate clamping if done by an average line assembler. Thanks Royce! By actual measurement at the bolt in the middle of the block, the new '26/'27 style bolts have only 3/8" of thread engagement with one washer. The modern bolt I have in there now has only 1/2" of threads to hold the load. As much as I like the new bolts, its hard to see how I could get away with using them. Too bad! Paul, I noticed your oil line goes all the way to the front of the engine, as most I've sen go towards the rear of #1 cylinder. Do you find locating the oil line there an advantage? I'm planning to install a high volume one (with the extra fitting on the hogshead rather than the mag post option) and want to be sure to locate it in the best possible spot on the engine. Thanks. Thanks. I've seen the kits that require drilling a hole in the block to attache the line to, but I'd rather not drill the block if I can use an existing hole. Bad enough to drill the hogshead for the fitting. This kit has a special hollow bolt that replaces one of the existing bolts and has an oil line fitting end. It is easy to install and works well. I have no idea if it is the best possible setup, but It is easy and adds to the safety of the front bearings. Vintage Paul, still morning my too short head bolts . . .
You are better off mourning the loss of the bolts than going forward and creating a mistake that many often do. As Royce points out with his engagement length, generally speaking all published torque values for steel against iron are based on 1.5 the diameter (minimum) engagement of the bolt itself. Steel against steel is less (1.25 in olden days, 1.0 in modern days with better steels). In the case of the Ford block this would work out to be 9 full threads, and in a T you are lucky to get 8 full to begin with and usually closer to 7! Sure some boast they go to 60-70 on torque, but it is pure luck in my humble opinion! Others post that they only go to 35-40 and achieve a seal and that works fine with them. If a torque rating value is based on 9 threads, and you are only pulling on 7...guess what you just did to the remaining threads? Now can some understand why they strip? There is a safety factor of course in all designs, but I don't believe Ford allowed a bunch here to begin with, and was stuck with the water jacket design. Remember, they originally 'thought' 3/8" bolts would work, and apparently didn't! We don't know why, or at least I don't know why, but there's a clue buried in there someplace. Perhaps they needed more holding torque than 3/8" would do? So they just stuffed the block as much as possible depth wise with the 7/16? The vendors use to offer domed dress up caps for standard bolts for those who wanted a bit of 'pop', but I haven't looked in a catalog lately to 'see' if they still do. 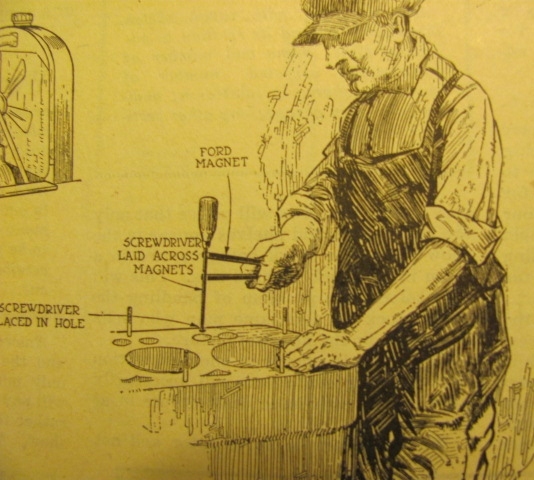 Agree with George, as for stripping out a head bolt, using torque values from a 'book' isn't the way with old Ford cast iron. The safe way is to clean the bolt holes super well, and then use a measure to determine the depth of each bolt hole. Ford mfg system was great for the age, but those bolt holes were gang drilled and tapped, and not all are the same uniform exact depth. 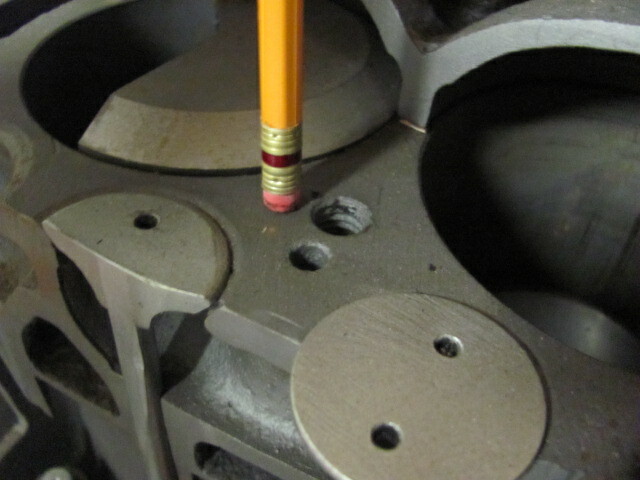 With the measure of each hole, check each bolt into that hole that it will seat. Then check that bolt again by passing it into the cyl head, and note the amount sticking thru. You can surmise then the depth of threads holding. On this install of a 'Z' head on a shaved block (.050" off), there was one bolt that 'turned' in the hole. Not enough bolt length. That bolt is the modern repro 'domed nickle'. So I used a bottom tap brazed to the extn. to reach to the bottom of the hole with the 'Z' head in place (didn't need to remove the head for just this one bolt) and cleaned the hole well. Using a store bought grade 5 bolt, that was a tad longer, but still checked by the measure to not hit the bottom of the hole first, that was the way I got the fix. I'm one of those guys who only torqued to 40 lbs. Of course I have a 1915 block and its said they are of poorer material. But my point is ... why torque more than you need? If you can get a leak free seal at 40, why torque to 50? FWIW I started at 20 lbs and then pregressed to 40 lbs in 5 lb increments. No leaks at all. I used Murray Fahnestock's bolt torquing pattern. Of course I have had to retorque after 30 min of engine run, then 1 hr then 4 hrs and again about 2 weeks later (most bolts never moved at this point, one or two turned about 1 degree and then the wrench clicked). If 40 doesn't work for you and you get weeping, you can always up it slightly later. As you can see in the picture, the McMaster-Carr modern specials are already installed. They were lubed with a bit of anti seize and took the torque of 50 lbs in stages. I have now taken them to 50 lbs four times, this last time they moved very little. This Model T is to be part tour car, part restoration & part art project. The project engineer (me) has to get a bit past his nose to feel good about it and those modern head bolts don't pass muster in the looks department. I left the purdy new nickel plated domed jobs off because this is to be a tour car and I don't want trouble on the road if I can help it. Thanks Roger, that might help. I was a bit surprised to find that none of the sources I know of for parts and vintage hardware had any high head or domed 7/16 x 3 1/2 bolts. With all of the Model Ts in the world needing them, I would have expected a ready market. Who can use the 3 1/4 ones? They are sold for the high head motors in the '26/'27 cars. Wouldn't all high head motors need the longer length? Possibly the Z head needs a longer bolt than standard? An aluminum head needs washers - they use up some of the useful bolt length. Maybe the surfaces under the washers on a Z head can stand some milling, but that's lots of work.. Thanks for the heads up on the short bolts since I was thinking of ordering a set to dress up. Guess the nickeled bolts are all the same from all vendors? Original flat & domed head bolts from my 25/27 engines measures 3 5/16". Small difference, but that 1/16" extra length of thread might be important for some engines. The thread protrudes 5/8" when a bolt is inserted through a head. These bolts were in a plastic bag with a blue oval the says ANTIQUE FORD PARTS on it. The package is marked T-3003-C-Q15, Dome Head Bolts, 1926-27, 030510/CB, MADE IN USA. The bolts were dumped in the bag with no wrapping or padding and while they look good now I had some fear that the bumping & sliding around during shipping would have damaged the nickel plating. I pulled two of the existing bolts out of the motor and installed two of these new ones finger tight. They sure did improve the appearance! The rule of thumb is you need one and one half diameters in cast iron to develop the full strength of the bolt. This would be 0.655", so Royce is right on. 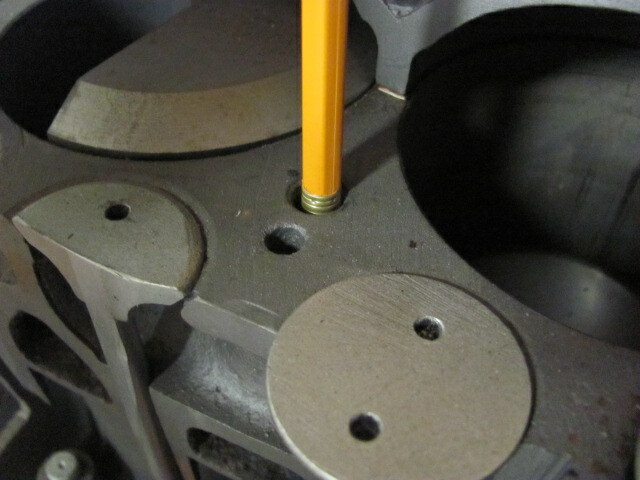 If you measure what sticks out the head and subtract 0.100" for the gasket you will have the thread engagement. I don't know if a Z head is thicker than a stock head or not. You might want the AN washer under the bolt head so it doesn't garf the aluminum when you tighten it. 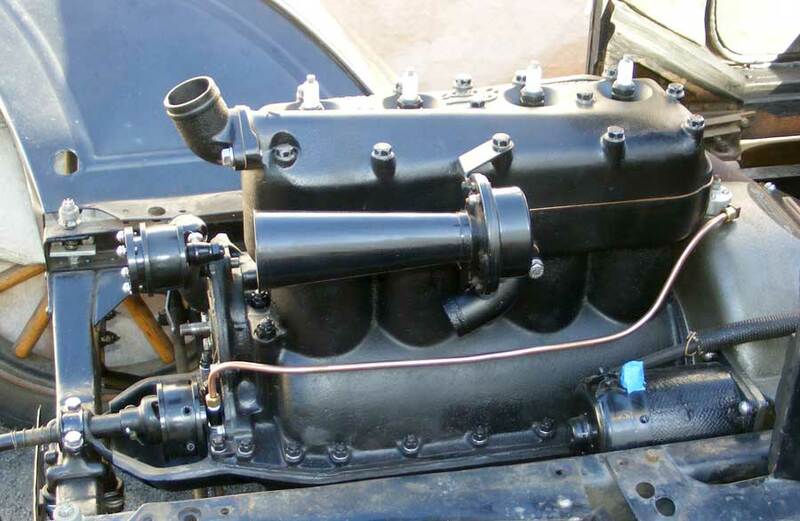 Texas T Parts has a PDF page on installing the Z Head. It says to use the high head bolts and stainless washers they supply. Are all "high head" bolts 3 1/4 long? Why would my new 1923 block need a longer size? Even with 3 1/2" I'm still only getting 1/2" or so of engagement on the two holes I tried. When chasing threads on the block I can't recall seeing anything seriously amiss, the threads all seemed to start near the top of the deck and didn't look too beat up. The tap ran normally. Vintage Paul, me thinks this situation is getting curiouser & curiouser . . .
A tad over 1/2" deep is about average for head bolt thread depth in the block. Just be real sure there is no debris in the bottom of the hole, a 'bottom' tap is essential to use. That is clever! I just have regular not bottoming taps but did use grease & a shop vac to pull the crap out of the holes, there was no shortage of it! Now there is no problem getting the bolts in. I will keep an eye out for some better looking bolts of appropriate length. I'll bet someone will tool up to make a batch and that they will be good sellers. I would think two finishes would be wanted, the nickel like the current ones and some sort of black finish for the older cars.